Red Velvet cake is an amazing creature. With its hint of chocolate, but not quite a chocolate cake. And it is so buttery. And don’t get me started on that red color. How do they make that red so vibrant? If only I could get my Fondant to come out like that! I’ll admit, I originally made this Red Velvet cake just so that I had something to put this cute heart cupcake topper on (you can check out my heart cake topper tutorial here). But this really was a fun project, refining the recipe until I got the perfect blend of flavors and the crumby texture this cake deserves. I used a blend of gluten free ingredients. To make it easier, you could use an all purpose gluten free flour mix. It would cut down on the number of ingredients. However, I find every blend to produce different results. Some blends have a great taste for one recipe while being too bitter for the next recipe. So, I steer away from blends. Until I develop that perfect blend for myself, that is! The cake is sweetened with a blend of erythritol (Swerve) and Xylitol. There is no after taste and these sweeteners taste just like sugar. That means that you’re left with a sweet tasting dessert that no one would know is sugar free! This Red Velvet Cake is topped with Cream Cheese frosting that has no refined sugar! This was a bit of a challenge at first. Let’s just say that my first attempt was disastrous! I wouldn’t feed it to my worst enemies, if I had any. 😉 I have never seen anyone do what I did for this frosting, but it worked out great! And I would do it again in a heartbeat. The Cream Cheese frosting is sweetened with Xylitol. Most Cream Cheese frostings use 4 cups of powdered sugar. My recipe uses just over 1/2 cup of granulated Xylitol. I made it like how you would make Italian Meringue Buttercream, but substituted some of the butter for cream cheese. The end result is a bit thinner than regular buttercream, but I find that to be the case with cream cheese frosting in general. Also, you can stiffen it by allowing the frosting to cool in the refrigerator until it reaches the desired consistency. Just be sure to beat it again prior to using! I hope you enjoy this Red Velvet Cake as much as I do. If you don’t have time to make it now, Pin it to save it for later! Red Velvet cake that has just the right blend of flavors and works perfectly with cream cheese frosting. Oh, and it is Sugar Free and Gluten Free. In a medium bowl, mix together brown rice flour, potato starch, tapioca flour, cocoa powder, baking powder, salt, and xanthan gum. Whisk to thoroughly combine and set aside. With an electric mixer, beat butter until light and fluffy. Add the xyltiol and granulated erythritol and beat until well combined. Add the eggs and oil to the butter mixture and mix until just combined. To the butter mixture, add vanilla and desired amount of food coloring and mix well. The red will deepen as dry ingredients are added. Alternate adding buttermilk and dry ingredients to the butter mixture, beginning and ending with the dry ingredients. Mix until just combined. Do not over mix! Add batter to prepared cupcake pan or cake pan. For cupcakes, bake for 20-23 minutes. For a 8" cake, bake for 30-35 minutes, or until a toothpick inserted in the center of the cake comes out clean. 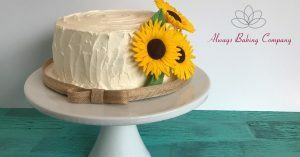 Smooth and creamy Sugar Free Cream Cheese Frosting with just the right amount of sweetness balanced with the tangy cream cheese. Enough to top 48 cupcakes or frost and fill an 8" cake. If you only have 1 mixing bowl for an electric mixer, do step 6 first and then set aside for later. While the xylitol is heating, begin whipping egg whites in an electric mixer with a whisk attachment. When eggs are frothy, add the cream of tartar. When soft peaks form, add the remaining 1/4 cup of xylitol. Continue to whip until stiff peaks form. The goal is to have the xylitol reach 245 degrees F at the same time that the eggs have reached stiff peaks. Continue whisking on high speed until the frosting has cooled, about 10 minutes. The mixing bowl should be roughly room temperature or slightly warmer. In a separate mixing bowl, combine cream cheese and 1 cup of butter. Beat with an electric mixer with a paddle attachment until well blended. Return the egg and xylitol to the stand mixer with a paddle attachment and turn the mixer on low. Add the cream cheese and butter blend 1 tablespoon at a time. Once added, begin adding butter 1 tablespoon at a time until either the buttercream has smoothed out or the butter is gone. Continue to beat the buttercream until the frosting is smooth and not runny. Mix in the vanilla extract. If buttercream is too soft, refrigerate until it has stiffened. Re-whip before using. For best results, use immediately. Frosting may be stored in the refrigerator for later use for up to 5 days. Re-whip before using.